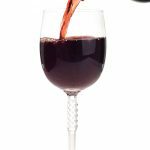 Frugal Tips to the Extreme – Do you love frugal tips? 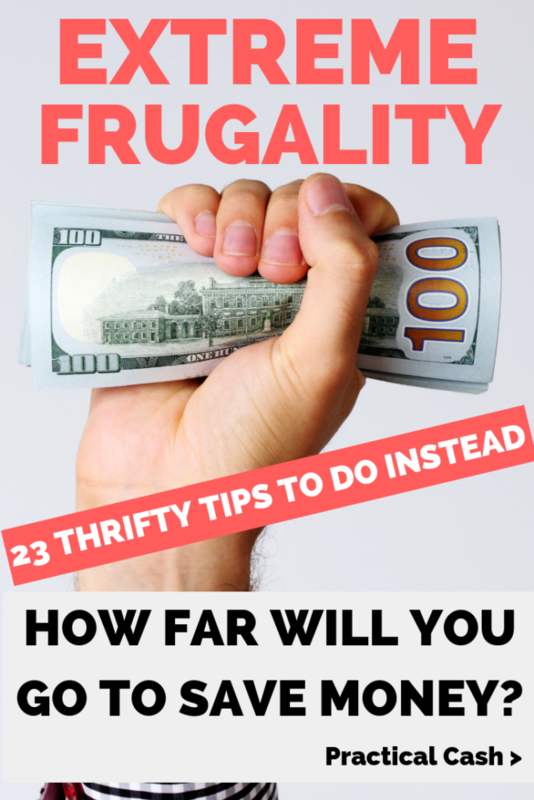 Have you heard of extreme frugality? Thanks to shows like TLC’s Extreme Cheapskates, you might watch fascinated and mildly horrified as people display their examples of extreme frugality and tell tales of budgetary scrimping. After watching someone eat roadkill for dinner or wash their laundry in the shower to avoid laundromat costs, you might be willing to chuck frugal living out the window altogether. How do you practice extreme frugality? What are your favorite extremely frugal activities? Is there anything you’re not willing to do ? Leave a comment below! But wait – there are frugal tips to be learned from the extremely frugal, even if you’re not willing to eat roadkill. 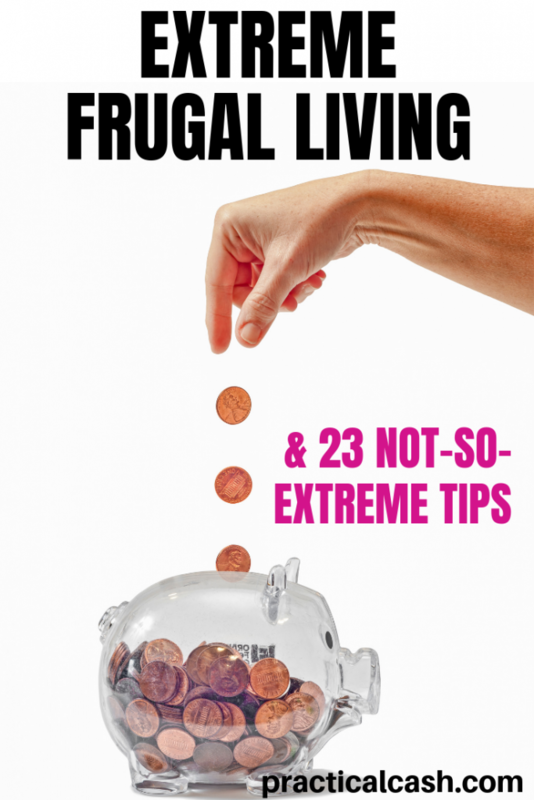 You can live frugal without taking it to the extreme. Frugality and saving money are very personal acts. Ultimately, through your actions, you are picking and choosing the financial goals that work for your family. 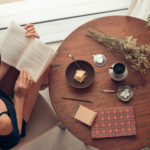 Just by learning about extreme frugality – even if you don’t choose to take your frugality to that extent – we can make our own lives more frugal by making choices that fit our lives. In the years when my family was paying off debt and becoming debt free, we took a lot of steps to slash expenses. I read constantly about saving money on a tight budget. 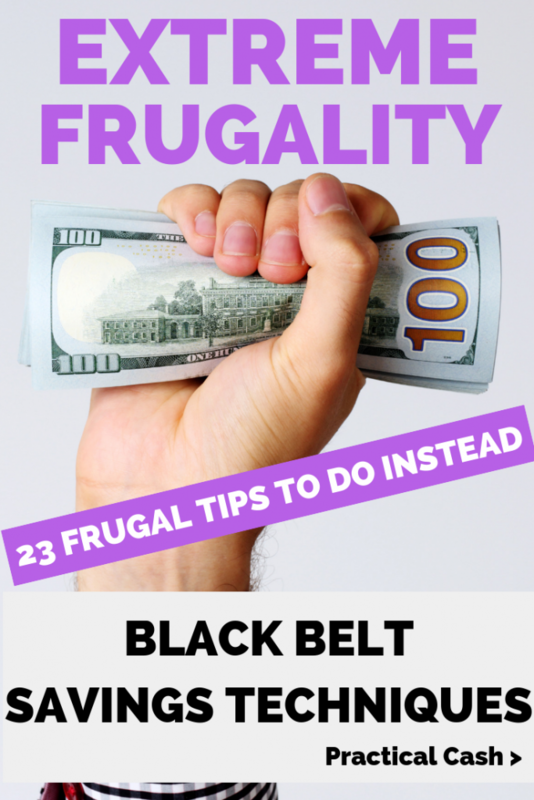 But even though some of the activities recommended by the extremely frugal just didn’t work for me, I did learn how to tailor the advice to fit my own family’s needs. 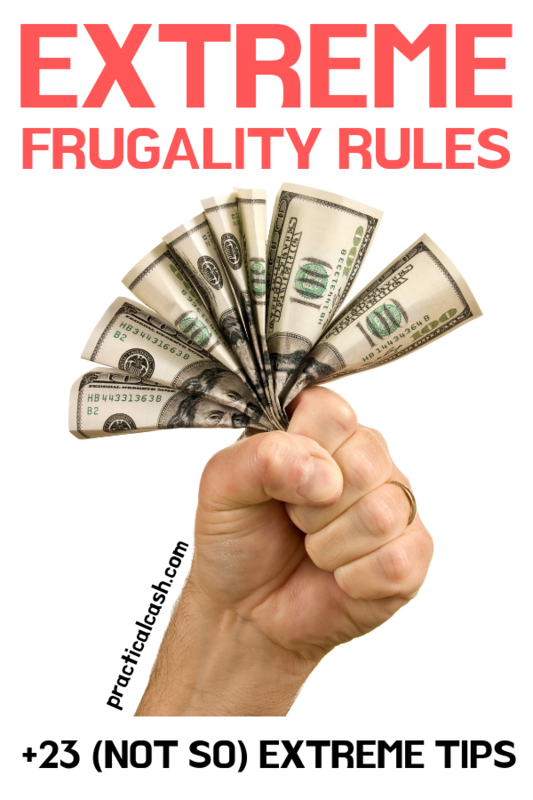 Here’s my list of extreme frugality rules that won’t get my personal support – and the frugal tips I adhere to instead. These ideas work well, whether your family has multiple paychecks or you’re trying to live frugally on one income. Reducing your food costs is an essential tactic of extreme frugality. Unlike your mortgage or your car payment, the amount you spend on your monthly food budget is variable. If your family is laid off from work or living paycheck to paycheck, you can’t reduce the mortgage payment but you can cut the grocery bill. 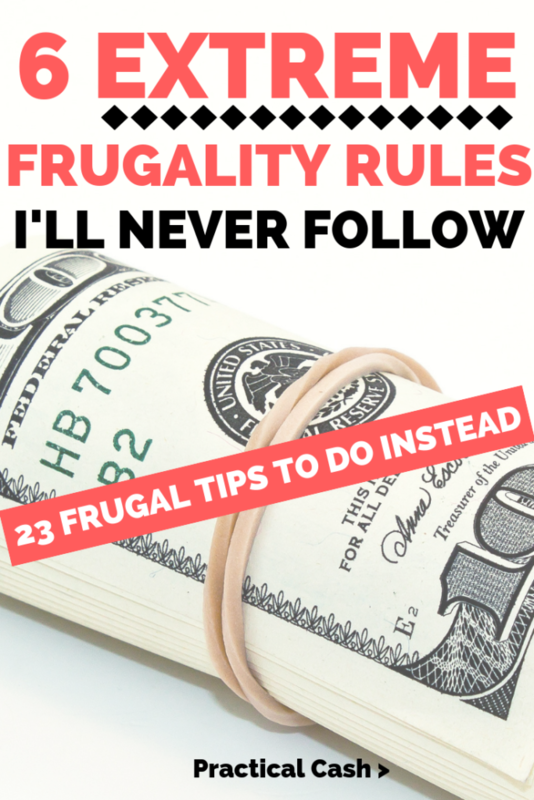 So many frugal tips revolve around cutting the amount of money you’re spending on food and saving money on groceries. One extreme frugal strategy often recommended is to eat beans and rice – or pasta and oatmeal – for a majority of meals. This is most certainly a cost cutting measure, since you can get a bag of dry beans and rice at the dollar store that would feed your family for several meals. Spaghetti is cheap and oatmeal definitely fills you up for very little expense. 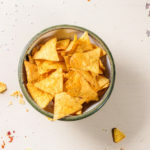 So, although I enjoy cutting costs and learning how to be more frugal, adding lots of carbs to my diet just doesn’t work for me as a savings strategy since I eat a keto diet and love keto snacks. I’m unwilling to do it. Prep all foods myself and cook with only raw ingredients (buying prepared foods adds to the cost). Eat at home instead of at restaurants. Meal plan every week to use up items I already have, avoid eating out, and avoid food waste. Look for proteins and vegetables on sale, since these items fit into my low carb diet. Budget meal prep and prepare meals in bulk so there’s always something to eat when I’m hungry. Living with roommates is a fantastic way to reduce your housing costs – after all, you’re splitting the utilities and expense of the common spaces instead of each paying independently. Or perhaps you’ve heard of house hacking – where someone who owns a home rents out rooms to help cover the cost of the mortgage or utilities, often living “rent free” in their own home. As extreme frugality practices, I’m in awe of people that choose to do this as a cost savings measure. And for multi-generational families, this can be an incredible benefit financially and socially. Personally, though, I am an extreme introvert – and living with people besides my immediate family members is just not something that I would choose to do. Choose “less house” than you need to keep your mortgage and utility costs lower. Keep possessions to a minimum to reduce the square footage your family needs to use (and pay for). Investigate ways to reduce your utility costs, like cutting cable or making energy use more efficient. Share tools with family and neighbors, so you don’t have to purchase them all yourselves. For people who live in cities or areas where public transportation is available, getting rid of a car makes extreme frugality sense – after all, a few Ubers or a bus pass is a lot cheaper than the cost of a car payment, insurance, gas, and registration. I’m fortunate to live in a beautiful, rural area – with no public transportation or many local amenities. The closest store is at least 15 minutes away. Other shopping is 30 minutes away. And there’s no way I’m going to go without access to my own vehicle. Fortunately, everyone gets to pick their own frugal priorities. For my family, car access is necessary. However, being as financially efficient as possible is possible. Pay cash for vehicles or pay any car payments off as soon as possible. Ask about teen driver insurance discounts by calling my insurer regularly. Batch errands to reduce gas usage. Have my son take the (free) school bus when he could drive. Share a car with my spouse or child. Drive my current car until it won’t run or costs a lot to repair. Consider becoming a 1 car family when my car becomes unusable. Choose car models that are gas efficient. Going “no ‘poo” is an extreme frugality method in which you just wash your hair with water – or maybe baking soda and apple cider vinegar. 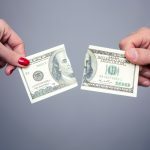 I will admit I did try this money saving tip several years ago, more for the scalp and hair benefits than the costs savings – but this is not an extreme frugal tip that I enjoyed. Wash my hair every other day to reduce shampoo costs. Choose a grocery store brand over a salon brand. Use coupons or buy shampoo and conditioner on sale. People who are extremely frugal may choose to avoid an Internet utility bill by using the library computers. Since my husband and I both work from home and require Internet to do our jobs, this isn’t a viable extreme frugality tactic for our family. If I lived next door to a library and didn’t work at home, this might work, though. Take a business tax deduction for a portion of my Internet charges (ask your accountant about this if you run a business). Purchase my own router so I am not paying a monthly fee to the cable company. Limit streaming services to one or two services so I don’t have a lot of monthly fees. Living in a van would be extremely tough with my family and our four pets, and housing is fairly cheap and plentiful where I live, so this is not an extreme frugality tactic that would work for me. However, for many people who love to travel or want to avoid the costs of a home or apartment, this is one of many extreme frugal tips that makes a lot of sense. Good luck, Diane. You can’t go wrong trying to trim expenses even when looking for work. Take care.